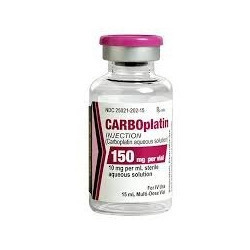 Prominent & Leading Wholesale Trader from Nagpur, we offer carboplatin solution. Backed by rich industry experience, we are supplying, wholesaling and trading Carboplatin Solution. It is a platinum coordination compound that is used as a cancer chemotherapeutic agent. Superior quality packaging material is used by experts to ensure safe transit of the offered medicines at clients’ premises. Looking for Zoledronic Acid Concentrate Solution ?